As our name suggests, we supply Firewood from the Borders! In fact, all our hardwood is sourced and cut within 30 miles of Stagewood Farm in Stow. Our Borders Hardwood contains a mixture of seasoned Ash, Oak, Sycamore, Birch, Alder, Cherry and Beech. All lovely hardwoods that are known for their excellent heat output and long burn time. Whilst other suppliers might be able to supply purely Ash or an Oak and Birch mix, this firewood does tend to be imported from eastern Europe where the forests lend themselves to the large scale and dense production of one species. 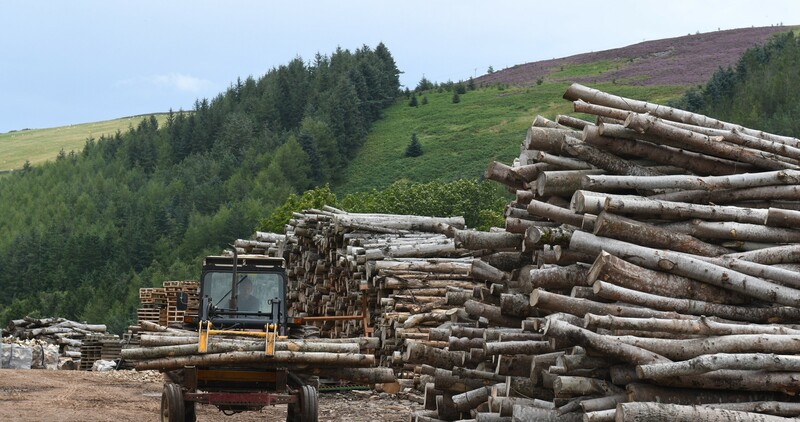 But because we source our wood sustainably here in the Borders, our firewood is a natural mix of quality hardwoods from local woodland maintenance and clearings. All species of trees have their own distinct characteristics and the wood has different initial water content, often determined by where a tree grows. All of our firewood is fully seasoned with a moisture content of below 20% for good burning. The calorific value per tonne is almost identical for all commonly used hardwoods and evensoftwood logs. Although the density varies a great deal, meaning for example a bag of softwood logs may be as much as 25% lighter. The less dense firewood are much quicker to season and much easier to light so are great for starting a fire. The denser species like oak and beech are much harder to light but burn for a very long time. As said, hardwoods are generally more dense than softwood and therefore burn for longer, producing more heat output but the density of the wood will affect how long the wood needs to be seasoned for, Oak for example is a very dense wood that can take up to 2 years to season fully. All of our hardwoods come from sustainable local sources and are ideal for use on both wood burning stoves or an open fire. Whilst hardwood is an excellent fuel source, it can be difficult to ignite from cold and softwood kindling is therefore best used to get your fire started as the resinous and fibrous characteristics of softwood help it to burn easily from cold. Once your fire is established and there is some heat in the base, you can then use your hardwood to maintain a lovely slow burning fire with a high heat output. We thought it would be useful if we introduced you to each of our hardwoods and give you a short description of their individual burning characteristics. Because our hardwood is made up of a mixture of these species, you can also enjoy a combination of their characteristics and benefits too. Oak is one of the best firewoods but it does needs a long seasoning period because of its density. Burns slowly and is long lasting. One of the most common types of trees, oak can be found pretty much anywhere throughout the country including the Borders, often growing to a massive size. Because of its density, oak produces a small flame and very slow burn, it is best when seasoned for a minimum of two years. Because it is an extremely dense hardwood tree, it burns for a very long time but because of its density, it does require continuous high heat to get it burning well so best mixed with lighter woods to get the fire going. But once it gets burning, there isn’t much maintenance to be done as it burns slowly and is long lasting. Produces good heat output and burns very bright and hot, meaning that it is a great fire starter. Birch trees are known for their unique bark, with several types in the species, the downy and silver birch are common in the borders and make excellent firewood. It is a softer wood, meaning that it is an excellent fire-starter because it burns very quickly. Birch burns easily and can be even be burnt unseasoned. It is best mixed with a slower burning wood such as Oak. Birch bark also makes an excellent fire-lighter and the perfect logs for getting your fire roaring, easily lit burning quickly with a hot flame. Part of the birch family it can be recognised by its distinctive orange colour. One of the least dense hardwoods meaning it lights very easily but burns very quickly with good heat. Beech is an excellent firewood which burns very well without a lot of sparks but because of its high water content it can take longer to season than other species. Beech trees can grow up to 100 feet tall and can easily be identified by its unique smooth, silver bark which is very clean and doesn’t flake off like other firewoods. Again, beech is common in the borders. Beech takes a long time to season and takes a bit more effort to light but burns very well and for a very long time. Doesn’t really spit well so good to mix with less dense timber to start your fire. Beech burns very much like ash, but does not burn well when green! It is an excellent firewood choice and the dense hardwood burns hot and clean without a lot of sparks. Sycamore, like other maples makes a good fuel log, burning well with a moderate heat output and good flame. Along with Ash probably the most common species of hardwood found in the borders. A member of the Maple family and a very good firewood. Produces a good flame and burns very well but should only be used if well-seasoned. It is a good firewood which works very well mixed with other slow burning hardwoods such as oak and beech. Easily lit, burns quickly with a good flame. Reckoned by many to be one of best woods for burning, Ash produces a steady flame and good heat output and is one of the most abundant species in the area. One of the best firewoods with a low moisture content even when green, but like all wood is best when seasoned. Gives a good heat output, a good flame and burns slowly, so for a long time. Ash is known for splitting very easily and for having a low moisture content which is good for us! A freshly cut piece of ash has a moisture content only slightly higher than seasoned ash. Lovely sweet smell when burning can spark a bit so care should be taken on an open fire. Burns well with a good heat. We hope that you have found this article both interesting and useful, remember if you would like any advice about firewood, please don’t hesitate to get in touch with us. Next post: Be Softwood Savvy!